Everett Martin, a retired professor of Animal Sciences at Washington State University, joined Branch 54 in 1992. He took his first leadership role by becoming our president in 2002 where he served until 2004. It is especially interesting to note that Everett graciously accepted the nomination for president in 2002, without having had the opportunity to serve as vice president previously! He then served on our board of directors from 2004 until 2006 when Everett became the Branch 54 treasurer, where he has now served for 11 years. It should be noted that his bookkeeping and financial management for the club has been very detailed and is second to none! Without a doubt Everett’s 24 years of service to EDGETA and Branch 54 has been tremendously beneficial to all involved. 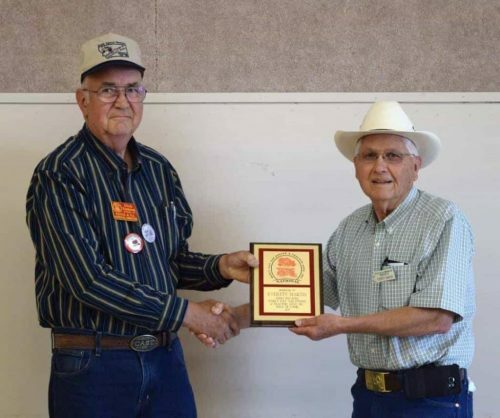 Everett’s 24 years of membership in Branch 54 and service to the club has been highlighted by not only his leadership duties but his attention to details. He has successfully guided us to become a 501 (c) (3) organization, which along with his detailed accounting records has complemented our fund raising activities that has allowed our club to issue two $400/each scholarships to graduating high school seniors involved in FFA each year that are located in the immediate Branch 54 membership area. Everett has also been key to finding meeting places for the chapter or knowing which member might be interested in hosting a meeting. You will always find Everett early at meetings setting up chairs or whatever must be done to help the members and officers, but most particularly our meeting hosts. Everett’s willingness to involve youth in our hobby is also to be highly commended, whether it’s a classroom of college students and/or younger students such as his grandson Jason, Everett is always more than ready to share his knowledge and passion for old iron with both the young and old. Everett has a modest collection of John Deere two cylinder tractors and the implements they came with. His shop facilities are very limited, so he starts with nice originals and fine tunes them to make them better still. He is known as Branch 54’s detail man as he has a keen eye for what is original and correct to most brands of tractors, plus he is a great research person hunting down many details on the internet for mystery items. Everett is also very eager to put his iron to-work, as there are no trailer queens in his collection! The summer and fall are the busy times for Branch 54 activities. Plowing days, local parades and tractor drives in the scenic Palouse hills of Washington and Idaho, and recently, mowing and baling wheat straw after harvest keeps him busy. You will find Everett at every one, as usually he has put the events together in the first place! Recently he answered a Craigslist ad that was simply advertising a “plow”. Turns out that the “plow” was a very rare John Deere “Gilpin” sulky horse drawn plow! Everett made sure it was saved and that it got into the right hands for restoration and preservation. He has also recently been involved in calling attention to an experimental John Deere tractor! In summary, Everett is a hard- working, resourceful, friendly and knowledgeable individual that would fit well into any EDGETA branch, but Branch 54 is very fortunate and thankful to have him on our team. Since this is a secret, we don’t know where Everett would like to receive his award if chosen, but we would guess that the NW Regional show in Filer, ID on June 16-17 would be the proper place.